For the first time, an international mixed martial arts event will take place in Pakistan. 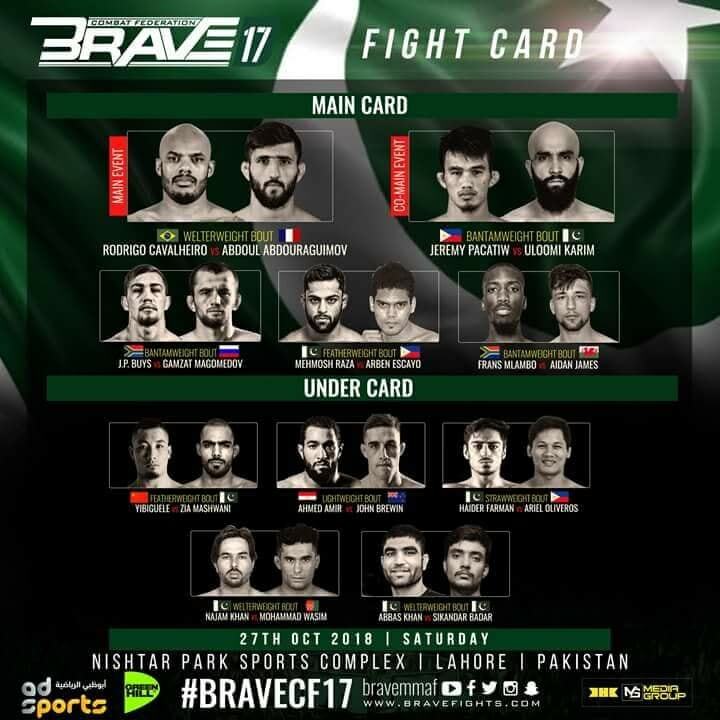 On October 27, 2018, Bahrain-based MMA promotion Brave Combat Federation will hold its 17th event titled “Brave 17” at the Nishtar Park Sports Complex in Lahore. Among the 20 fighters on the “Brave 17” fight card, seven are from Pakistan. They are Abbas Khan, Sikandar Badar, Najam Khan, Haider “The Giant” Farman, Zia Mashwani, Mehmosh “The Renegade” Raza and Uloomi Karim Shaheen. Shaheen, Raza and Farman are all from Islamabad. Their respective opponents at “Brave 17” are Filipinos. In the third bout of the evening, Farman will face Ariel “The Lady Boxer” Oliveros of the Philippines in the strawweight division. In the seventh bout, Raza will compete in the featherweight division against Arben “Big Bang” Escayo of the Philippines. In the co-main event, Shaheen will compete in the bantamweight division against Jeremy “The Juggernaut” Pacatiw of the Philippines. This makes the former the first Pakistani fighter to co-headline an international MMA event. Representing Team Fight Fortress, Shaheen currently holds a professional MMA record of 7 wins and 4 losses. He is coming from a unanimous decision loss to Emran Tarakhil of Afghanistan at “Fight Nights Afghanistan 4” on August 3, 2018. On the other hand, “Brave 17” marks Farman’s third Brave CF bout. After losing to Jomar Pa-ac of the Philippines at “Brave 2: Dynasty” on December 2, 2016, Farman defeated Atif “Little Hawk” Mohammad Khadim of Bahrain at “Brave 9: The Kingdom of Champions” on November 17, 2017 both via unanimous decision. In the main event of “Brave 17,” Rodrigo Cavalheiro of Brazil will face Abdoul “Sinistro” Abdouraguimov of France in the welterweight division. Aside from Pakistan, the Philippines, Brazil and France, eight other countries will be represented in the historic sports event namely Afghanistan, Kuwait, New Zealand, China, Ireland, Wales, South Africa, Bahrain.